Between June and August, I was part of the EPFL Research Internship Program. At the time, I was studying physics at Carnegie Mellon University in Pittsburgh, United States of America. Specifically, I was doing research on Computational Condensed Matter Physics at Institute of Theoretical Physics of EPFL, being advised by Prof. Oleg Yazyev. It was also the first time I have been to Switzerland and everything I have experienced in the past two months becomes my virgin memories of this beautiful country. Retrospecting, I feel so lucky of having such thorough experience as my first encounter. In the rest of the article, I am going to share my impression of Switzerland in three aspects: life, study and work. My first day in Lausanne did not go as easy as I had expected. Being completely new to the city, I was at a loss at the very beginning. Everyone speaks a different language than I speak back in the US. Although I’ve had quite many study on French, such a first-handed and immersive francophone environment still made me so nervous. Luckily, I quickly realized how good at English the Swiss people are, which reduced my anxiousness lot. It did not take a very long time before I totally forgot about the discomfort of my first day, especially when I realized how convenient the public transit of Lausanne is. My living place was only ten minutes’ walking distance to the Metro station, as well as the train station, which literally enable me to visit any town in Switzerland as I pleased. Thanks to such well-developed transit systems, I managed to travel to lots of places in Switzerland, such as Zürich, Bern and Geneva. The moment I stepped off the Metro station of EPFL, I was attracted by the intellectual mural paintings on the entrance of the campus: I saw endless famous mathematical for physics formulas being painted on the underground tunnel leading to the entrance of the campus. Even before entering the campus, I could already feel the devotedness of this polytechnic university towards the study of science and technology. The architecture of the campus is a combination of modernism and utilitarianism, which reminds me of the young age of this institute. My interaction with the research group went along pretty well. The enthusiastic welcome from my advising professor and his secretary made me feel so warm and helped me so much with my settling down to the new study and working environment. The research group I was working with is the one of international compositions. I met with people coming from at least five different countries, some in Europe, some at the other side of the world. From this, I could catch a glimpse of the extent of international participation of Switzerland in academia, a feature that renders this country competitive in the world for decades. This entry was posted in Non classé on 28 August 2017 by georgecai. Between May and August of 2016, I was a part of the EPFL Research Internship (RI) Program. At the time, I had just finished the third year of Mechanical Engineering at the University of British Columbia. I had never been to Europe before, so I was both excited and nervous for the opportunity to work abroad. Looking back, my time there ended up being one of the best times of my life, and to summarize, I’ve included a list of the top five things I found about Switzerland, the RI program, and life in general. One of the nicest things about Switzerland, and Europe really, was the efficiency of their transportation systems. Despite living quite far from EPFL, my commute was under 25 minutes thanks to some conveniently located Metro stops. Outside of Lausanne, the trains were both a feasible and affordable way to get across the country on the weekends. In terms of passes, I highly recommend buying the annual SBB Demi-Tarif (Half-Fare Card), the annual SBB Track 7 card, and the 3-month Mobilis pass. These were pricy to pay for up front, but I think I made my money back within the first month. Having taken French in elementary and high school, I was eager to see what it would be like to be immersed in a French-speaking city. Naturally, I was extremely rusty, which made things difficult at the start when trying to get my housing, cell phone, transit passes, internet, and food situations organized. Eventually though, things went much more smoothly and I was running errands without too much difficulty. Beyond the language, it was really interesting to notice just how much people valued their healthy eating, hiking, and of course, soccer (or football, sorry). All of these factors helped make Lausanne feel so unique. At EPFL, I worked in the Biorobotics Laboratory under the supervision of Dr. Auke Jan Ijspeert. As someone who is interested in both biology and robotics, I couldn’t have picked a better lab placement to suit my academic interests. I got to work with really cool cheetah and salamander robots and the workplace was filled with super friendly and knowledgeable researchers. I always appreciated that, within my work, it felt like there was always someone I could ask when I was struggling on a problem or wanted to learn something new entirely. My hometown is known for its mountains, forests, and rivers, and boasts some very impressive trails, many of which I have been lucky enough to hike over the years. Perhaps I had just become accustomed to the nature back home, but nothing I had seen previously could compare to the magnificence and splendor of hiking through the Swiss Alps. I tried to get outdoors as much as possible just to see the country and the mountains for what they are, and would recommend any potential visitor to do the same. There were so many panoramic trails and views, but if I had to choose, my favourites would be in the Engelberg, Zermatt, Interlaken, and Ziegelbrucke regions. Last but not least, the best part of my adventure in Switzerland was the people I met there. Doing this internship alone would have still been great, but being able to have this experience alongside a dozen other interns from across the world was something else entirely. I loved having people to explore and adventure with on the weekends, play foosball with at lunch, watch Game of Thrones with every Monday, or to just chill out by the lake in the evenings after work. While my time in Switzerland lasted only three months, I know that the memories we made together will last a lot longer. Cheers, Switzerland. It’s been fun. This entry was posted in Non classé on 1 January 2017 by jonathanpmarr. My three months of summer were spent living in an AirBnB room in a pretty Swiss house hidden somewhere in the peaceful town of Préverenges, a five-minute walk from the shores of Lac Léman, and working in a small inorganic chemistry lab tucked away in a corner of the CH building in EPFL, where many toxic/radioactive/flammable/pungent, but not in any way less colourful and fascinating, chemical reactions were carried out and studied extensively. It was, perhaps, one of the best summers I could ever remember. Inorganic chemistry is a vast field of research, for it covers the syntheses, structures and behaviours of compounds based on virtually any of the elements found in the Periodic Table, except for carbon. Of course, it would be a Herculean task for any one research group to work on all of these elements, so each group tends to choose to focus on a collection of elements that behave similarly to one another, for it is then easier to classify and rationalise any trends and anomalies discovered. For my three months in EPFL, I was attached to the Group of Coordination Chemistry led by Professor Marinella Mazzanti, whose main interest lies in the rich chemistry of lanthanides and uranium. The project to which I was assigned involved an investigation of the structures and reactivity of several lanthanide Schiff-base complexes: the goal was to try to store electrons in these complexes using a strong reducing agent, making them much more nucleophilic, thus enabling them to become very reactive towards the activation of small molecules such as carbon dioxide, carbon monoxide and even molecular nitrogen. This could potentially open up new avenues of research for other fields such as catalysis and synthetic chemistry. A day-to-day routine in the lab would involve setting up new reactions, analysing on-going reactions using various techniques such as Nuclear Magnetic Resonance (NMR) spectroscopy, Mass Spectrometry, etc. and attempting to isolate pure, crystalline products from completed reactions for further examinations such as single-crystal X-ray diffraction and elemental analysis. Almost everything we do in the lab is air-sensitive, and so special techniques to handle these chemicals under an inert atmosphere must be used to ensure the safety and integrity of our experiments. Of course, the actual picture was somewhat less rosy as very often things never really worked out the way we expected them to, and here came the ever-insightful discussions with more senior members of the group: with their experience, they were able to give very useful advice which helped me get out of the bottleneck and move forward by interpreting the data more precisely and improving on the experiments. I cherished these discussions, for through them I not only gained more understanding of my project in particular, and of f-block chemistry in general, but I also became more bonded to my lab-mates (it is all about forming bonds in chemistry, is it not?). But my Swiss experience was not just confined within the four walls of the lab. Even though I am not a fantastic fan of travelling, the scenic beauty of Switzerland still managed to compel me to get out of my room every now and then, with some reluctance at first when I had to get up early on a Saturday morning to catch a train, but with full bliss and marvelment by the end of the day after having been immersed in the fresh air and the breath-taking views of nature. That was the time when I walked up the vineyard terraces in Lavaux on a rainy day, hoping to steal a grand look on the many arrays of vines, the wavy surface of the lake and the grey Alps fading into the distance behind the clouds and the rain. It was such serenity to just let myself get lost amongst the cute little houses, hidden staircases and secret streams of water flowing down into the lake. There was no sunlight on that day, but everything still somehow managed to glow up so vividly… Then there was the time I took a vintage train to go up to Rochers de Naye, a mountain of the Swiss Alps with an elevation of around 2000 m above sea level that promises a mesmerising panorama of nearby valleys and of Lac Léman. It was cold and windy up there, so after walking around to absorb as much of the view as possible, it was perfect to just sit down in a local bar and slowly enjoy a cup of hot chocolate. And then there was the time I went to a festival called KleinLaut based in Riniken, which was literally in the middle of nowhere. However, thanks to it being in a small town and hidden among the woods and mountains, it did not get overloaded with people and noises. There were fun activities for everyone — children and adults alike — to engage in, all food was home-cooked, and the bands played handsomely. It was relaxing to just wander around and enjoy the food, the music and the people, in a place far away from crowded and rowdy city centres. KleinLaut Festival, Riniken: Turbostaat playing — and of course everybody enjoyed the music! My three months in Switzerland have been a wonderful experience: I have made new friends with my lab-mates and with the other EPFL interns through work as well as through the various picnics and BBQs we organised, learnt a great deal of new chemistry, and been thoroughly amazed by the enthralling beauty of nature. It was hard to say goodbye to my lab-mates, my housemates, and anybody else who has been part of my experience, but I hope that one day I will be able to come back, be it for something long-term, or even just for a short visit, and relive some of the best moments I will always treasure. This entry was posted in Lab work, Life in Lausanne, Science and Research at EPFL, Visiting Switzerland on 18 September 2016 by Huynh Cong Bang. Sion is a homey town where bus drivers greet pedestrians on the streets, the capital of Canton Valais Wallis, and the site of the EPFL Energypolis campus where I had worked for the past summer. Energypolis consists of seven research laboratories that focus on renewable energy, health and environmental sustainability, lead by professors affiliated with the Institute of Chemical Sciences and Engineering (ISIC) from the main EPFL campus. The various exciting projects include gas separation, hydrogen storage, solar-to-fuel conversion, carbon dioxide capture and storage, and what I worked on: vanadium redox flow batteries (VRBs). Redox flow batteries is an interesting field of research as it provides a rechargeable electrochemical energy storage system that may be useful in large-scale utility applications, to compensate for the instability of renewable energy sources such as solar and wind. I was very fortunate to be a part of this project in the Laboratory of Physical and Analytical Electrochemistry (LEPA) where I learned a lot about flow batteries in practice: the concept, assembly, and of course the intricacies to improve its efficiency. My task was to test how different membranes and temperatures affected the batteries, but it was much more work than it sounds: setting the correct voltage limits to avoid anodizing the electrode, determining the optimal amount of electrolyte for each set of tests, finding novel ways to keep a constant temperature for the entire apparatus… But these troubleshooting experiences gave me great insights to what a PhD experience would be like. Overall, it was a very fruitful experience! And of course, traveling! Switzerland is one of the most beautiful countries in the world and it’s also in the center of Europe, which makes traveling very convenient: it takes less than 4 hours to go to Paris and Milan by train, less than 2 hours to fly from Geneva to Barcelona, Munich, Prague, etc., and of course Switzerland itself is simply breathtaking! As many posts have mentioned, Half-fare cards, Track 7, and your fellow wonderful interns will make your trips even more fantastic! Also, many attractions offer significant discounts if you are with a group of 10 or more. Jungfrau – “Top of Europe”! After I came back to the U.S., a friend asked which city was my favorite during my three months of interning/traveling in Europe. I could not give a clear answer to this question, but Switzerland was most definitely my favorite country. Carrol (Qiwen) Xia, University of California, Berkeley. This entry was posted in Non classé on 11 September 2016 by Carrol Xia. 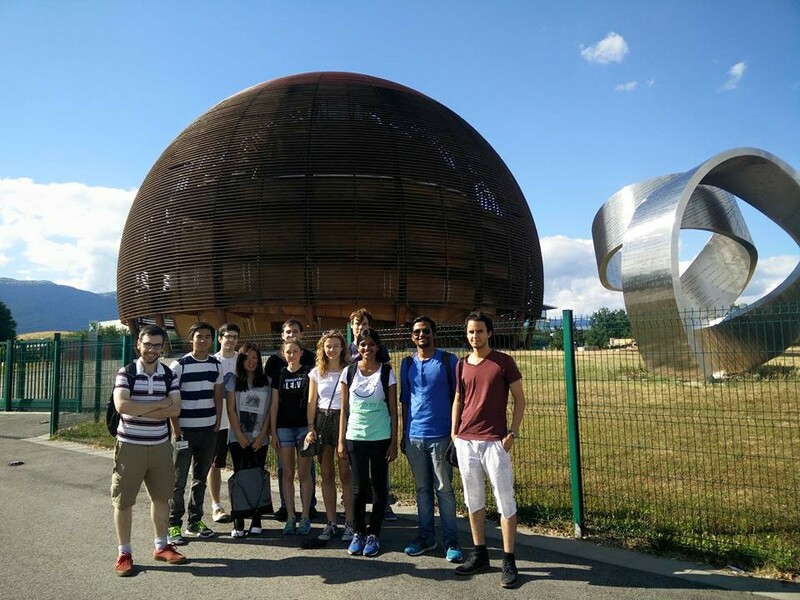 This summer, I went to EPFL as a Research Intern. And no surprise, it has been one of my best summers ever! Working at EPFL has been a great experience. I worked at Automatic Control Lab under Mechanical Engineering Department. As a Mechatronics student, it has been a extremely valuable experience to me because the projects here are really innovative and advanced. From bio-robots to UAV, there are robots that you have never imagined. I believe that you will always find a lab that interests you whatever your professional specialization is. Apart from EPFL, Switzerland is also a beautiful country to visit. Switzerland is not big and transportation is super convenient thanks to SBB ( the Swiss Train company). Its cities are also small enough to just walk around, including the big ones like Zurich and Geneva. And how beautiful is Switzerland? Whenever you pull out your phone/camera, take a picture, and it can me breath-taking. If you are a football fan like me, Zurich is a must on your list. And in Zurich, you have to go to FIFA Museum. Here, the REAL Rimet Trophy is displayed. What’s my favorite Swiss city? It has to be Lucerne. Everything is blended well together. The cloud, the river, the bridge, the swans. Perfect. There are also great hikes you shouldn’t miss. Pack your toblerones, take a train ride up to Matthorne, eat them before the lake. The experience will make you never forget. Also, probably the most legendary hike ever, is the ridge of Interlaken. With the cliffs beside you, every move has to be careful. The view? Astonishing. There are just too many things to name,. chocolates, cheese, chess and on and on and on. You have to be there to check it out. If you love to see it by yourself, I would say, EPFL research program is great. And do not miss it. This is life time experience. You will fall in love with this amazing country. This entry was posted in Non classé on 10 September 2016 by captainseesaw. So it’s summer break, and you know you should get an internship, but you also want to travel before settling into that 9-5, 20 vacation days per year work regime. Why not both? The best part about interning in Switzerland is that during the week you gain valuable professional experience, and during the weekend you get to travel Europe. A lot of the other posts give great summaries and tips for this program, and it’s hard to say anything about work since each lab is so different, so I’ll focus on some of our hiking adventures. Switzerland is known for its gorgeous mountains (second to its cheese reputation, of course), and we had our fair share of hiking. First stop was Mont Salève, which overlooks Geneva (the mountain’s actually in France). The trail is a grueling 1.1km vertical ascent, with a consistent ~40 degree slope all the way. It’s well worth the effort though, for this great view of Geneva. If you want you can also take the cable car, but where’s the fun in that? Round two, hiking by the Matterhorn near Zermatt, the iconic Toblerone mountain. We planned a nice panoramic hike: cog train to Rotenboden to get a nice picture with the Matterhorn reflected in the lake, hike down to Rifflealp and over to Blauherd on the 5-Seenweg, a trail that passes by 5 mountain lakes (map). From there, we could take the cable car down to Sunnegga, and a cog train back to Zermatt. So we thought. Turns out the last cable car from Blauherd leaves at 5pm, and we got there at 5:20pm. No problem, we can just hike down to Sunnegga, and take the cog train from there. Except the last train from Sunnegga leaves at 6pm, and according to the trail map, we were 70 minutes away! So began an epic race down the mountainside to make the last cog train–if we missed it, we’d also miss the last train from Zermatt back to Lausanne. Hope was not in our hearts, but we ran all the same, suffering from dehydration and fatigue. Ahead of us was 3.8 km in horizontal distance, 300m of vertical descent. And we made the entire thing in 35 minutes, just in time for the cog train. Lessons to learn: Read the timetables! And bring lots of water! Also, be warned that the trails around there are at ~2500m in elevation. This means the sunlight is super strong, so pack up on sunscreen and reapply it often. Not done yet. Next was Interlaken, and the infamous Hardergrat trail. The trail is “spent on a sharply defined ridge, with significant, even airy, drops on both sides, in some places, 1500 meters of drop” (info here). Excited? The full trail is 27km long, which takes around 10 hours. We only walked about a kilo along it, following trail 4 in this map for the most part, since we didn’t want to get stuck on a mountain again. If walking on a foot-wide trail with 60 degree drops on either side of you sounds like a nightmare, you can still get your adrenaline fix at Creux du Van. It’s a nice pleasant hike that takes you on top of a giant, horseshoe cliff. No danger of falling if you keep your distance from the cliff, but you’ll probably take a risk or two for that perfect Instagram shot. Overall, this summer has been a great experience, and one that I would highly recommend. See you soon, Switzerland! This entry was posted in Non classé on 10 August 2016 by xrilex. At EPFL, I worked in the Laboratory of Renewable Energy Science and Engineering (LRESE) and I worked there from July to September 2015. My project was about maximizing the performance of water splitting device, using sunlight as the energy source to form H2 and O2 as the valuable products. This technology has a very bright future in the next few years, and I am proud to be part of its development. During my internship, I learnt so many things, both in academics and socially. From the academic point of view, I learnt how to structure my approach in doing the project. I learnt how to manage my daily timetable and split the tasks wisely so that I could finish the project in a very limited amount of time — I learnt how to multitask. I had the chance to use some sophisticated laboratory equipment such as Scanning Electron Micrograph (SEM) and Metal Sputtering Machine – to use these machines I had to enter a chamber called cleanroom and wore an “astronaut-like” outfit! But more importantly, I learnt that in research, 75% of your time is spent trying to explain something that you did not expect to happen in the first place! Apparently, that’s what science is about. This experience will surely help me succeed my 4th year project in Oxford which I am currently doing – the internship seems like a head-start! For my social life, I have also gained a very unforgettable experience. I had the chance to meet and be friends with brilliant students coming from top universities around the world – MIT, Cambridge, Stanford, you name it! Building a network and friendship with these people is surely something that is priceless. We had several trips together, once was to CERN, Geneva. The largest scientific lab on earth, a place that is second to none! In overall, I would undoubtedly recommend this programme to anyone who wants to have a great AND productive summer. Not only those who have passion in research, but also those who are considering it. You won’t waste your time being here. The FUN part is guaranteed! Boat trip organised by the lab! This entry was posted in EPFL Campus, Lab work, Life in Lausanne, Non classé, Science and Research at EPFL, Visiting Switzerland on 10 November 2015 by pemb4028. Welcome to EPFL ! Share your experiences during your Research Internship Program at EPFL and your life in Switzerland, and read other interns’ articles.